The Dilophosaurus was a rather large dinosaur that existed during the early Jurassic period. It was one of the biggest dinosaurs to exist during the early Jurassic period. Its name stands for 'double crested lizard'. The Dilophosaurus does have two thin bones that form a crest on the top of its head. It is speculated that these crests played a role mating displays. Dilophosaurus has been portrayed as appearing rather nonthreatening, but because of its size and the fact that it was a meat eater, this is a bit hard to fathom. Finding quality Dilophosaurus art prints can be a bit difficult because of the “cartoony” feel to many available pieces. The key is looking for the artwork that is produced by a talented paleo-artist. One such artist is Josef Moravec, whose desire to present dinosaurs as accurately as possible in his well-researched paintings has resulted in his works being prominently displayed in Natural History Museums throughout North America and Europe. The Dilophosaurus has been a very popular dinosaur in movies and documentaries. It was one of the features of popular movies in the last decade, although its depiction of size and weight were drastically reduced. The actual Dilophosaurus was almost half a ton in weight and was approximately 20 feet long. Reconstructions of this dinosaur also show it as a beautiful, athletic animal as well. There is also no reason to believe that it could spit poisonous venom, or that it had a decorative ruffle of flesh around its neck as depicted in “Jurassic Park”. 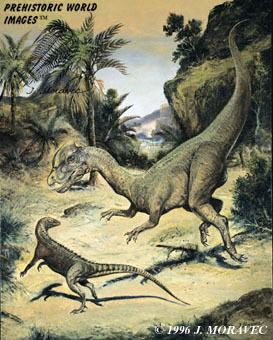 Other meat eaters that existed in the same time period and region as the Dilophosaurus included the Syntarsus and the Segisaurus. The more prevalent plant eaters of the time period included the Scutellosaurus, Anchisaurus, Massospondylus and the Ammosaurus, though it is speculated that some were omnivorous. The Dilophosaurus had socket set teeth, which was ideal for hunting prey. It also walked on two legs making it a bipedal in nature. Dilophosaurus art prints that depict the dinosaur as small and even timid are based more off of movie producers' ideology rather than the actual truth about the size and girth of the animal. The Dilophosaurus was a rather intimidating dinosaur. It had long, slender teeth that overhung part of its jaw. These teeth were razor sharp and were used to slash and tear at the flesh of other dinosaurs. It also had sharp claws on both of its hands that were also used to ravage and kill in order for it to feed. This was a fast dinosaur that could outrun many of its contemporaries and it had a muscular tail that not only helped it to balance its weight, but also aided it when fighting for food or territory. In terms of the dinosaur realm of the early Jurassic period, the Dilophosaurus was one that would garner much attention. Having a Dilophosaurus art print for home or even the office will definitely engage the interest of all who see it.